Next? Diving into knits! – Nice dress! Thanks, I made it!! Last time I sewed anything with a knit fabric I was in grade 10. (That was a long, long time ago!) It was a heavy 100% polyester knit and it was solid pink! Very cool indeed! I made a t-shirt style top and hipster pants, almost a perfect match for this McCalls 3280. 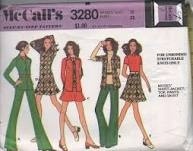 Can you imagine $1.00 for a McCalls pattern! Now that I think back it was really heavy, thick material and really really pink. (ugh!) Another annoyance was that the pants didn’t really fit well. Ya they were hipsters and ya they were tight all the way down to their bell bottoms, but they had a tendency to slip down if I moved and the elastic waist band rolled down and dug into me. More importantly the crotch seam was just not quite right! Need I say more? But hey, I made them myself and they were fashionable and I wore my pink outfit to school proudly! 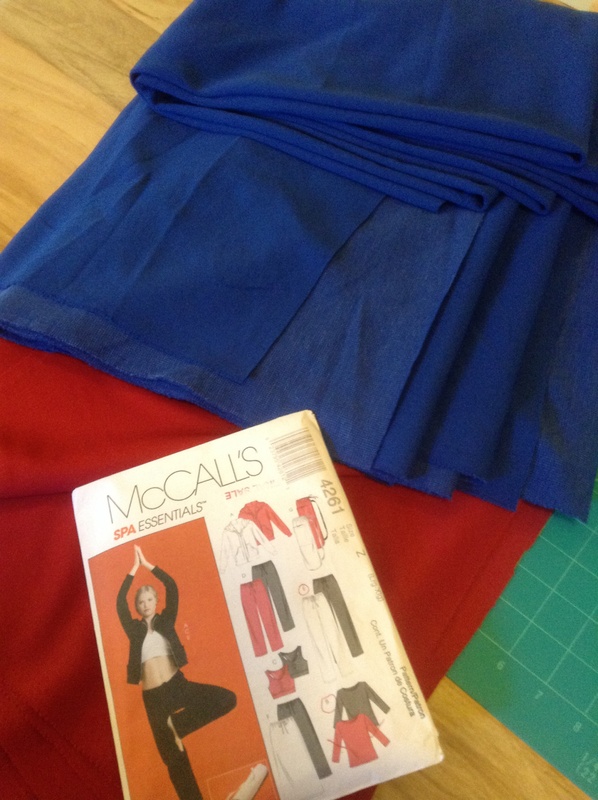 I haven’t sewed a pair of pants since and I haven’t sewed a scrap of 100% polyester knit fabric since! Flash forward many decades, there are hundreds of different knit materials around, with different patterns, weight and stretch. So here I go again, with my knits spread out on my kitchen table and my pattern, McCalls 4261. A pattern loaded with activewear. I have my favourite colours, a red to make two t-shirts and a royal blue to make two pairs of pants. The red looks the same on both sides so as I cut out each piece, I put a safety pin on the right sides. I don’t want to ruin the look by mixing up right sides and wrong sides! The royal blue is definitely different on the right side. I was surprised to see that the right side has small white lines running through it which changes the solid royal blue to a softer blue. I never even noticed that until I started to cut the material! Here is the front bodice piece. 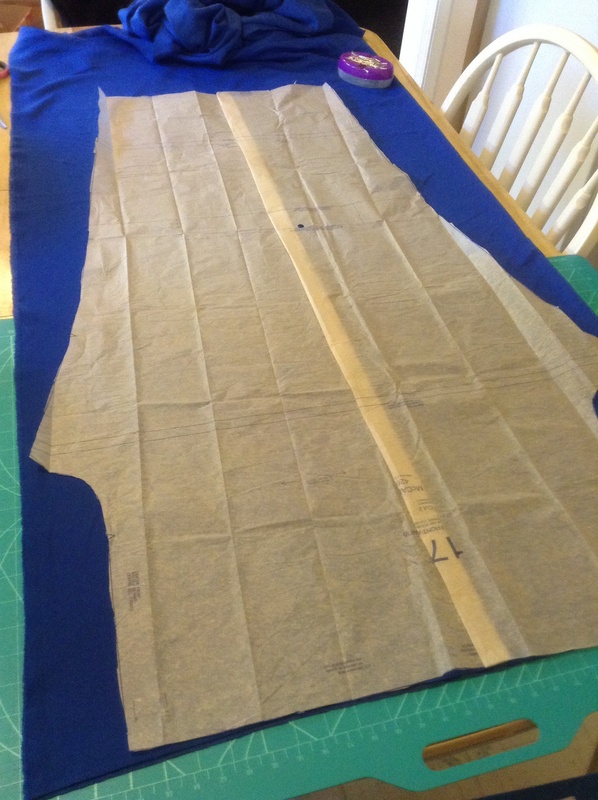 It curves in at the waist and I just want a straight t-shirt, so I am going to cut the side straight, not with the curve the pattern calls for. Oh, yes, my favourite sleeve length too – long enough to keep me warm and yet short enough not to drag in sink water! I have discovered the “twin needle”. It works like a charm! I found this video to help me out. 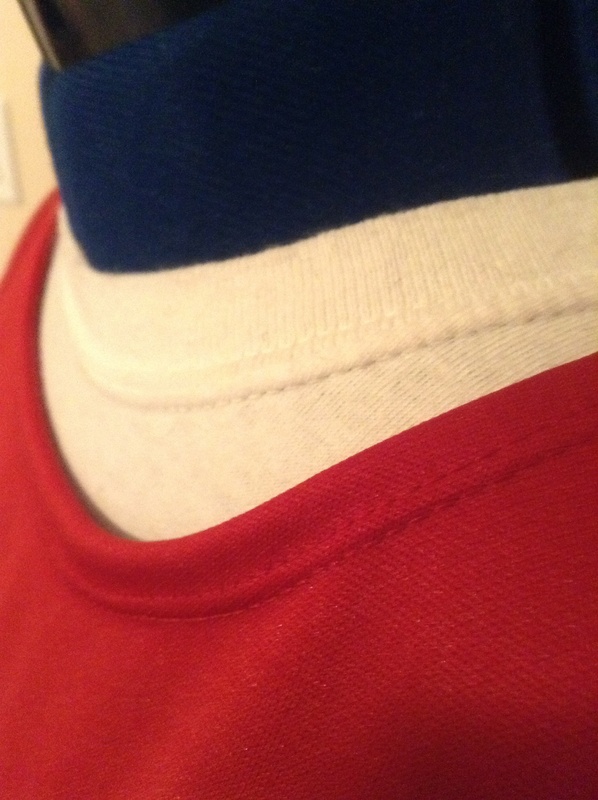 Can you see any difference between the white top’s (store bought) hem and the red (“I made it”) hem? I do. I like the red one better! I love the pants pattern. There is one piece… ONE! And you cut out two of them and then sew them together… Again, sew easy! I think I am going to change the pants up a bit. Maybe cut them out smaller, hence the fold in my pattern, so that I can put a stripe of red down the side, or maybe make a wide waistband on them. I shall think about it. I attempted knits properly for the first time a few months back. I had never before looked at the stretch stitch on my machine. 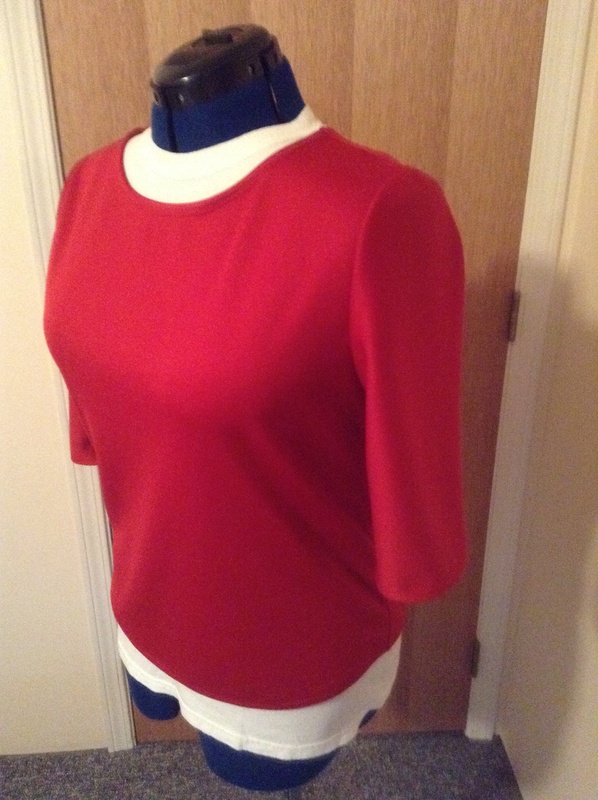 I found some great advice on line and used the twin needle for my hems which looks great. I love your colours, the finished top looks great. Hello! Wow, pink stretchy pants. I`m a fitness instructor and I think the only thing I`ve worn pink are my tops. Way to go and yes, definitely be proud of your accomplishment. I was amazed that you still had the pattern! It`s too bad you don`t have a picture of the pants. You could probably sell them as “vintage.“ I love 3/4 length sleeves. They are my favorite. Long enough to keep me warm, but short enough that when I wash my hands, the edges don`t get wet. Twin stretchy needles! I have to get myself some. 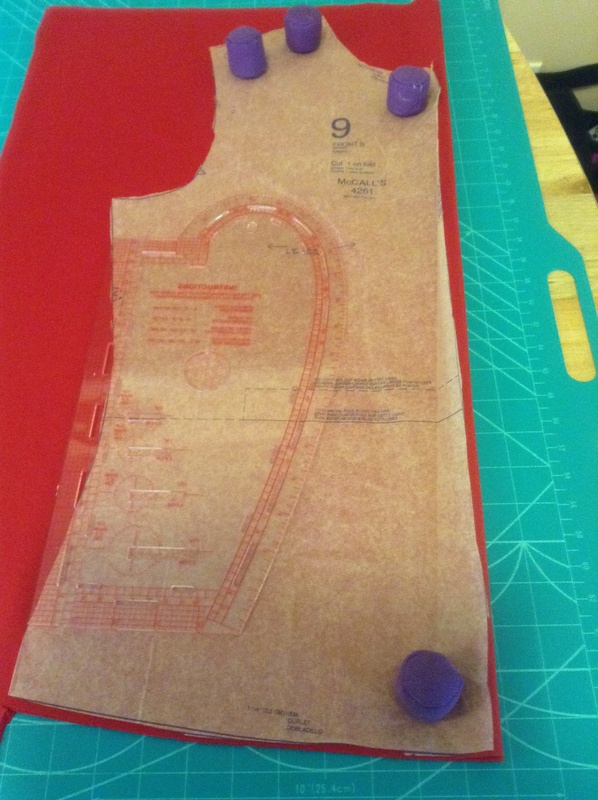 I`ve just started sewing with a stretch needle (70 or 80) and it`s so nice to try sewing stretch material and not have the string break or have big loopy stitches. I`m not sewing pants, baby steps, but after many attempts, and even melting my stretch material with my iron, I successfully made a running bracelet (like a tennis wrist band) which a person could tuck a house key or money. I also find as a fitness instructor that the wide band waistbands for pants are the best. If the elastic is too narrow, no matter what you do, you still feel like you`re being cut in half. Can`t wait to see the stretch pants. I really enjoyed this blog. Cheers. Thanks for reading my blog and commenting! I am glad you are having fun with your sewing. Keep it up, baby steps, and you will be sewing complete wardrobes of activewear! Wow…I’m blown away. Beautifully done, kiddo. Your top looks great! I really love knits and wear a lot of knit tops, so I figured the Craftsy “Sewing with Knits” Class would be a good investment. It has a lot of tips and tricks for using a regular machine to whip up knit shirts, dresses, skirts, and yoga pants. My machine is a little stubborn, as it doesn’t have an adjustable pressure feature, but I am doing my best to use it for knits. I love the twin needle! Thanks! Yes I love the twin needle too, looks so pro, but it is so easy! I have a book – Sew knits with Confidence by Nancy Zieman – that I can read on the bus during my commute to and from work.